Every Easter, children around the United States look forward to seeing what the Easter Bunny has left in their Easter baskets. Much like Santa Claus, the Easter Bunny comes in the middle of the night to deliver goodies like chocolate eggs and marshmallow bunnies. While the story of Santa is widespread and has been around for centuries, the Easter Bunny is a more modern sensation. Believed to have been brought to the United States by German immigrants in the 18th century, the legend of the Easter Bunny—or Easter Hare—is similar to Santa Claus. In addition to stopping off on the night before Easter Sunday to deliver gifts, the Easter Bunny has traditionally been a judge of children’s behavior. As time progressed, the legend of the Easter Bunny grew and changed until it became the character that we know today. With its big smile and basket of treats, the Easter Bunny hops from house to house to wish everyone a happy Easter. 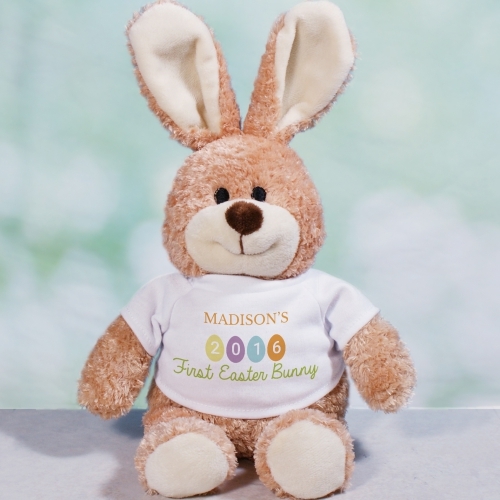 It is no surprise that the soft and cuddly Easter Bunny has become a favorite among children! One of the most common representations of this adoration is the prevalence of plush Easter Bunny toys and gifts. Alongside all of the sugary treats that the Easter Bunny brings, plush dolls are one of the most popular Easter gifts for kids. 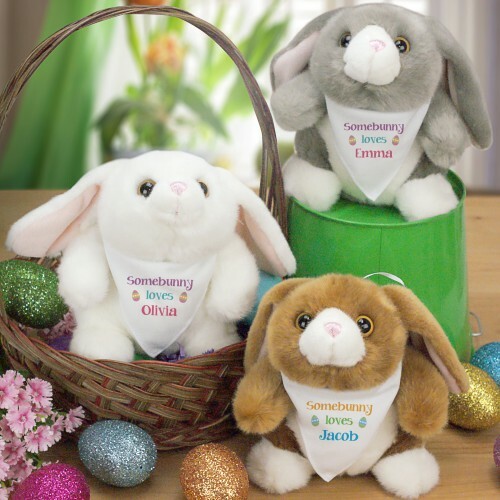 Help your little one celebrate Easter this year with a plush animal that they will love snuggling up with! Personalized My First Easter Bunny - 24"
Flapper Taddle Toes - 13"
At 800Bear, we recognize how important of a role stuffed animals play in the lives of young children. As they grow and learn, it is important to have a buddy with them to offer security. Studies in child psychology have found a great importance in comfort objects, known professionally as transitional objects. So, when you buy your child a plush Easter bunny it will serve a bigger purpose than just being cute. These stuffed animals can become your son or daughter’s favorite buddy! 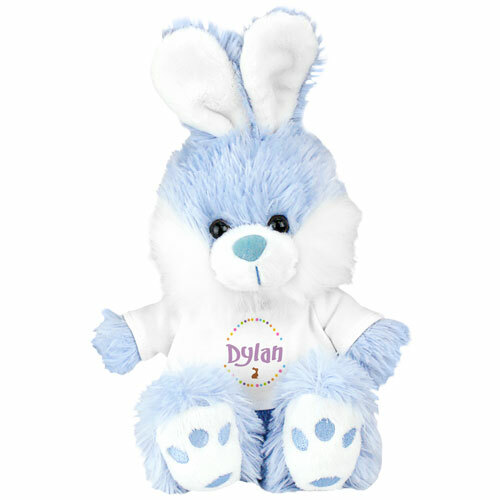 We have great Easter stuffed animals for every kid! Find the chick, bunny, or bear that is right for your son or daughter.